REDONDO BEACH, Calif., Jan. 5, 2016 -- The Defense Advanced Research Projects Agency (DARPA) and the Office of Naval Research have awarded Northrop Grumman Corporation (NYSE:NOC) the third phase of the Tern unmanned systems program. Phase three plans to include final design, fabrication and a full-scale, at-sea demonstration of the system. Tern seeks to develop an autonomous, unmanned, long-range, global, persistent intelligence, surveillance, reconnaissance (ISR) and strike system intended to safely and dependably deploy and recover from small-deck naval vessels with minimal ship modifications. Designed to operate in harsh maritime environments, Tern aims to enable greater mission capability and flexibility for surface combat vessels without the need for establishing fixed land bases or requiring scarce aircraft carrier resources. 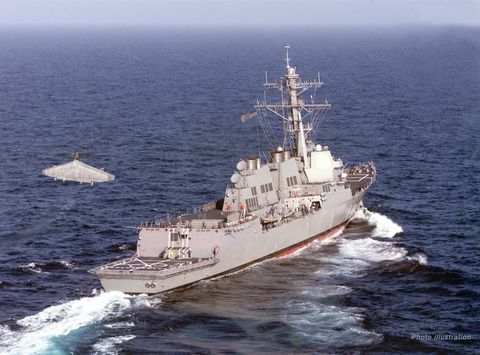 "We intend to highly leverage our Unmanned Systems Center of Excellence to develop and demonstrate this type of demanding unmanned systems capability to advance the Navy's mission," said Chris Hernandez, vice president, research, technology and advanced design, Northrop Grumman Aerospace Systems. "We believe our unique ship-based unmanned systems experience, expertise, and lessons learned from programs including our MQ-8B/C Fire Scout, MQ-4C Triton, X-47A Pegasus and X-47B UCAS, is critical to the success of the Tern." The Northrop Grumman Tern team includes its wholly owned subsidiary Scaled Composites, as well as General Electric (GE) Aviation, AVX Aircraft Company and Moog. Northrop Grumman's Tern solution seeks to provide an innovative system that integrates mature and advanced technologies, including a distinctive propulsion solution designed to help expand global persistent ISR/strike capabilities for small-deck naval surface vessels. "Using an innovative design that integrates vertical take-off and landing transitioning to an efficient flying-wing for cruise, our team is creating a system that we believe would achieve Tern's revolutionary performance objectives in support of our combatant commanders," said Ralph Starace, director, advanced design, Northrop Grumman Aerospace Systems. "Our full-scale demonstrator system is highly traceable to our operational concept to burn down risk, resulting in a compelling step forward for this game-changing, multi-mission capability," said Bob August, Tern program manager, Northrop Grumman Aerospace Systems. Northrop Grumman's research, technology and advanced design organization is dedicated to basic and advanced research, technology development, and advanced design to continue delivering unparalleled solutions to customers.